Exalting Archosauria | What's In John's Freezer? Today is the 210th anniversary of Charles R. Darwin’s birthday so I put together a quick post. I’d been meaning to blog about some of our latest scientific papers, so I chose those that had an explicit evolutionary theme, which I hope Chuck would like. Here they are, each with a purty picture and a short explainer blurb! Also please check out Anatomy To You’s post by Katrina van Grouw on Darwin’s fancy pigeons. First, Brandon Kilbourne at the Naturkunde Museum in Berlin kindly invited me to assist in a paper from his German fellowship studying mustelid mammals (otters, weasels, wolverines, badgers, etc. ; stinky smaller carnivorous mammals). 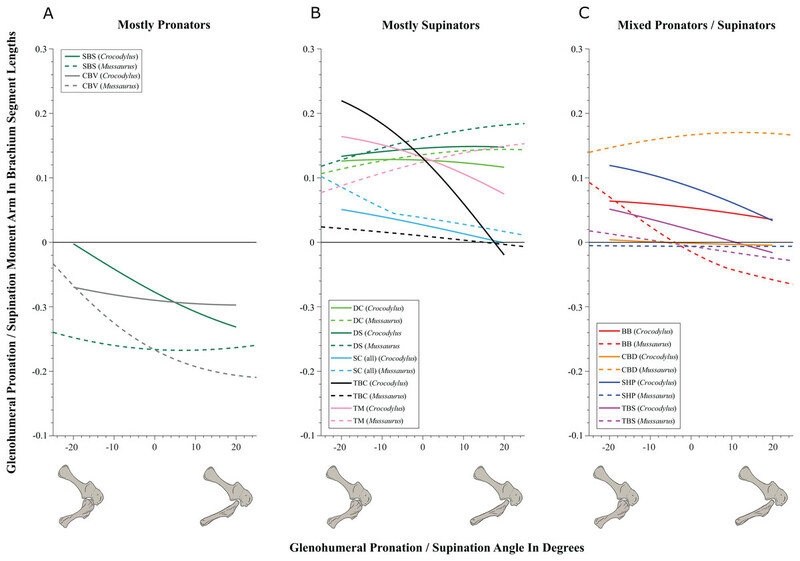 Here we (very much driven by Brandon; I was along for the ride) didn’t just look at how forelimb bone shape changes with body size in this ecologically diverse group. We already knew bigger mustelids would have more robust bones, although it was cool to see how swimming-adapted and digging-adapted mustelids evolved similarly robust bones; whereas climbing ones had the skinniest bones. The really exciting and novel (yes I am using that much-abused word!) 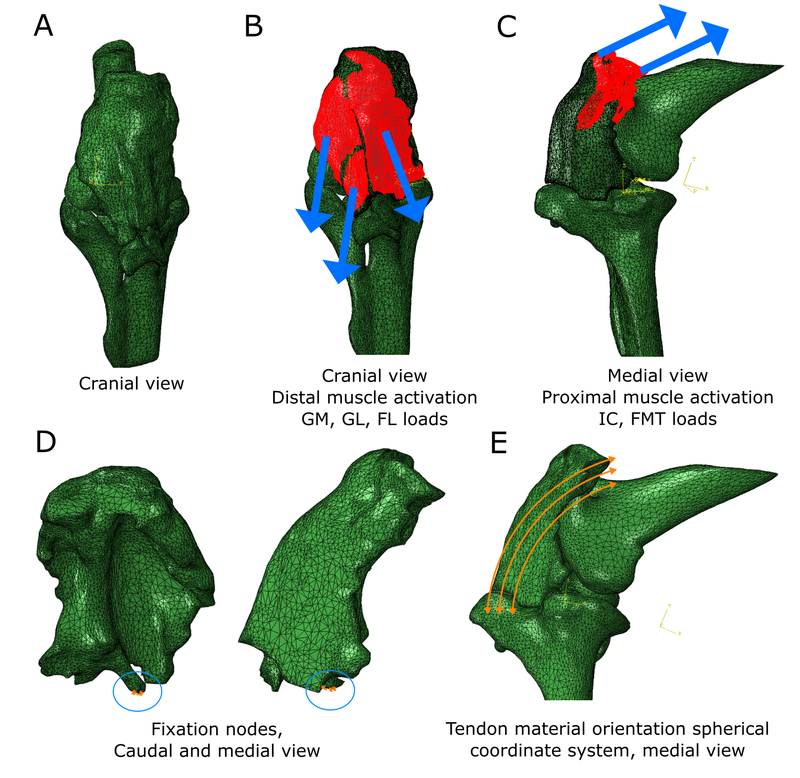 aspect of the paper is that Brandon conjured some sorcery with the latest methods for analysing evolutionary trends, to test how forelimb bone shapes evolved. Was their pattern of evolution mostly a leisurely “random walk” or were there early bursts of shape innovation in the mustelid tree of life, or did shape evolve toward one or more optimal shapes (e.g. suited to ecology/habitat)? We found that the most likely pattern involved multiple rates of evolution and/or optima, rather than a single regime. And it was fascinating to see that the patterns of internal shape change deviated from external shape change such as bone lengths: so perhaps selection sometimes works independently at many levels of bone morphology? Various evolutionary models applied to the phylogeny of mustelids. Then there, coincidentally, was another paper originating in part from the same museum group in Berlin. This one I’d been involved in as a co-investigator (author) on a Volkswagen (yes! They like science) grant back about 8 years ago and since. There is an amazing ~290 million year old fossil near-amniote (more terrestrial tetrapod) called Orobates pabsti, preserved with good skeletal material but also sets of footprints that match bones very well, allowing a rare match of the two down to this species level. John Nyakatura’s team had 3D modelled this animal before, so we set out to use digital techniques to test how it did, or did not, move—similar to what I’d tried before with Tyrannosaurus, Ichthyostega and so forth. The main question was whether Orobates moved in a more “ancestral” salamander-like way, a more “derived” lizard-like way (i.e. amniote-ish), or something else. 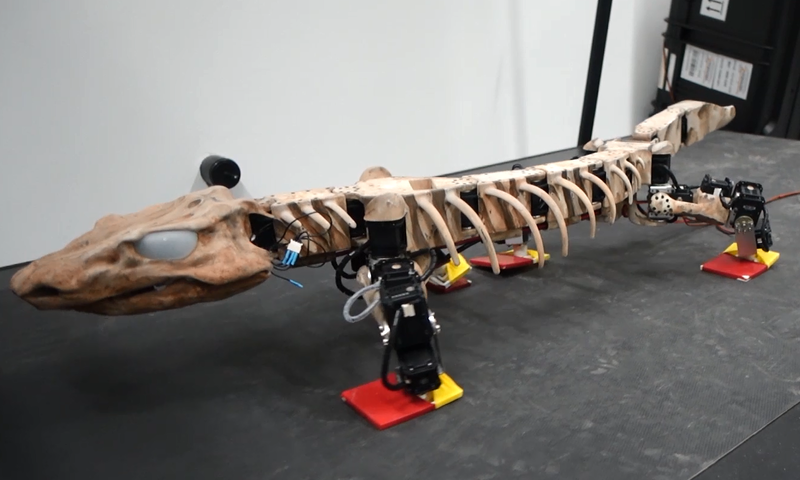 The approach was like a science sledgehammer: we combined experimental studies of 4 living tetrapods (to approximate “rules” of various sprawling gaits), a digital marionette of Orobates (to assess how well its skeleton stayed articulated in various motions), and two robotics analysis (led by robotics guru Auke Ijspeert and his amazing team): a physical robot version “OroBOT” (as a real-world test of our methods), and a biomechanical simulation of OroBOT (to estimate hard-to-measure things in the other analyses, and matches of motions to footprints). And, best of all, we made it all transparent: you can go play with our interactive website, which I still find very fun to explore, and test what motion patterns do or do not work best for Orobates. We concluded that a more amniote-like set of motions was most plausible, which means such motions might have first evolved outside of amniotes. You may remember Crassigyrinus, the early tetrapod, from a prior post on Anatomy To You. 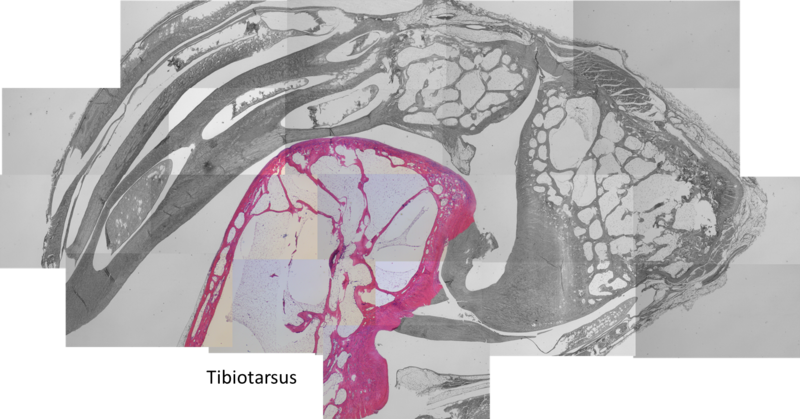 My PhD student Eva Herbst finished her anatomical study of the best fossils we could fit into a microCT-scanner and found some neat new details about the “tadpole from hell”. Buried in the rocky matrix were previously unrecognized bones: vertebrae (pleurocentra; the smaller nubbins of what may be “rhachitomous” bipartite classic tetrapod/omorph structure), ribs (from broad thoracic ones to thin rear ones), pelvic (pubis; lower front), and numerous limb bones. One interesting trait we noticed was that the metatarsals (“sole bones” of the foot) were not symmetrical from left-to-right across each bone, as shown below. Such asymmetry was previously used to infer that some early tetrapods were terrestrial, yet Crassigyrinus was uncontroversially aquatic, so what’s up with that? Maybe this asymmetry is a “hangover” from more terrestrial ancestry, or maybe these bones get asymmetrical for non-terrestrial reasons. The oddly asymmetrical metatarsals of Crassigyrinus. 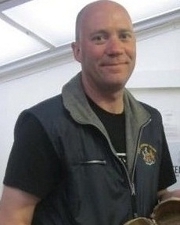 Finally, Dr. Peter Bishop finished his PhD at Griffith University in Australia and came to join us as a DAWNDINOS postdoc. He blasted out three of his thesis chapters (starting here) with me and many others as coauthors, all three papers building on a major theme: how does the inner bone structure (spongy or cancellous bone) relate to hindlimb function in theropod dinosaurs (including birds) and how did that evolve? Might it tell us something about how leg posture or even gait evolved? There are big theories in “mechanobiology” variously named Wolff’s Law or the Trajectorial Theory that explain why, at certain levels, bony struts tend to align themselves to help resist certain stresses, and thus their alignment can be “read” to indicate stresses. Sometimes. It’s complicated! Undaunted, Peter measured a bunch of theropod limb bones’ inner geometry and found consistent differences in how the “tracts” of bony struts, mainly around joints, were oriented. 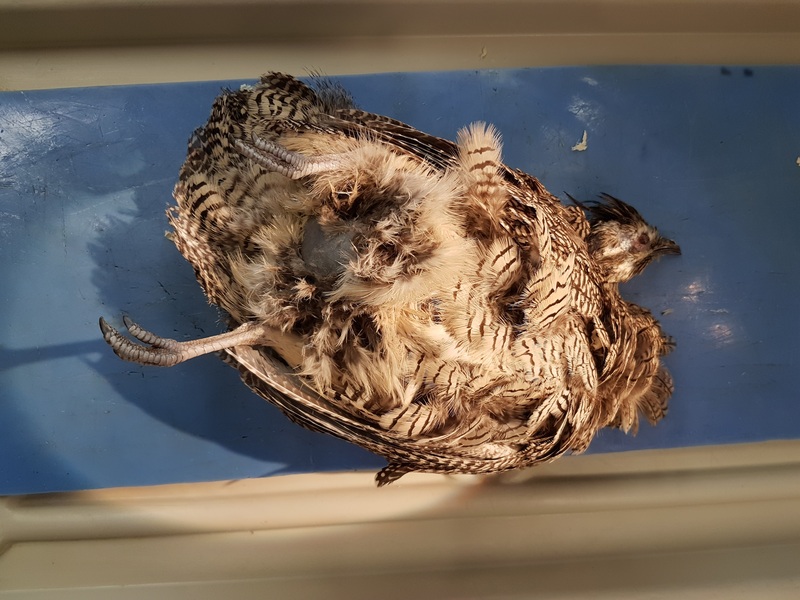 He then built a biomechanical model of a chicken to test if the loads that muscles placed on the joints incurred stresses that matched the tracts’ orientations. Hmm, they did! Then, with renewed confidence that we can use this in the fossil record to infer approximate limb postures, Peter scanned and modelled a less birdlike Daspletosaurus (smaller tyrannosaur) and more birdlike “Troodon” (now Stenonychosaurus; long story). Nicely fitting many other studies’ conclusions, Peter found that the tyrannosaur had a more straightened hindlimb whereas the troodontid had a more crouched hindlimb; intermediate between the tyrannosaur and chicken. Voila! 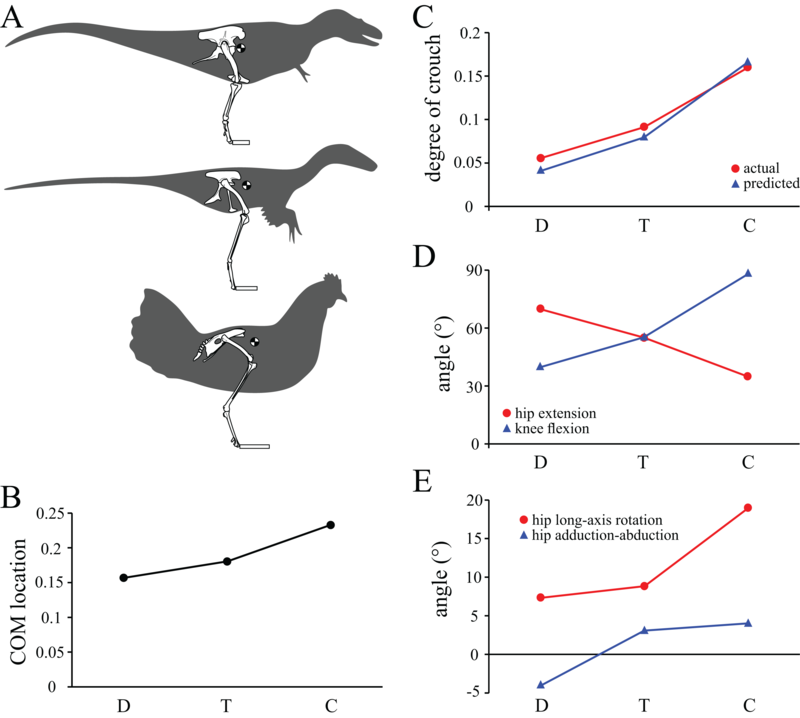 More evidence for a gradual evolution of leg posture across Mesozoic-theropods-into-modern-birds. That’s nice. 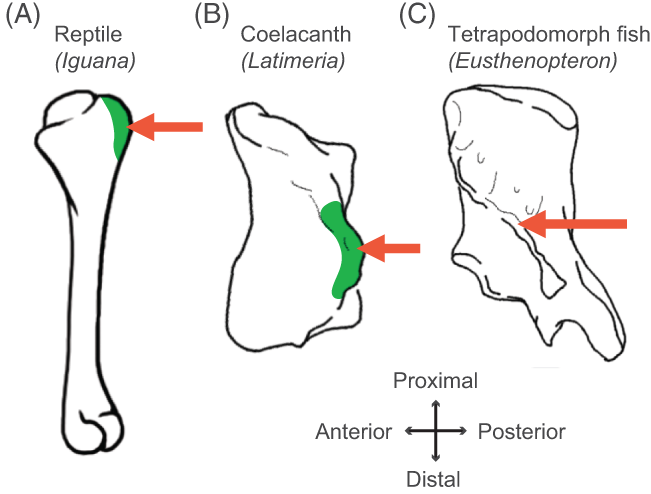 Three theropods, three best-supported postures based on cancellous bone architecture. (1) Former PhD student Chris Basu published his thesis work w/us on measuring giraffe walking dynamics with force plates, finding that they move mostly like other quadrupeds and their wobbly necks might cost them a little. (2) Oh, and Chris’s second paper just came out as I was writing this! We measured faster giraffe gaits in the wilds of South Africa, as zoo giraffes couldn’t safely do them. And we found they don’t normally go airborne, just using a rotary gallop (not trot, pace or canter); unlike some other mammals. Stay tuned: next we get evolutionary with this project! 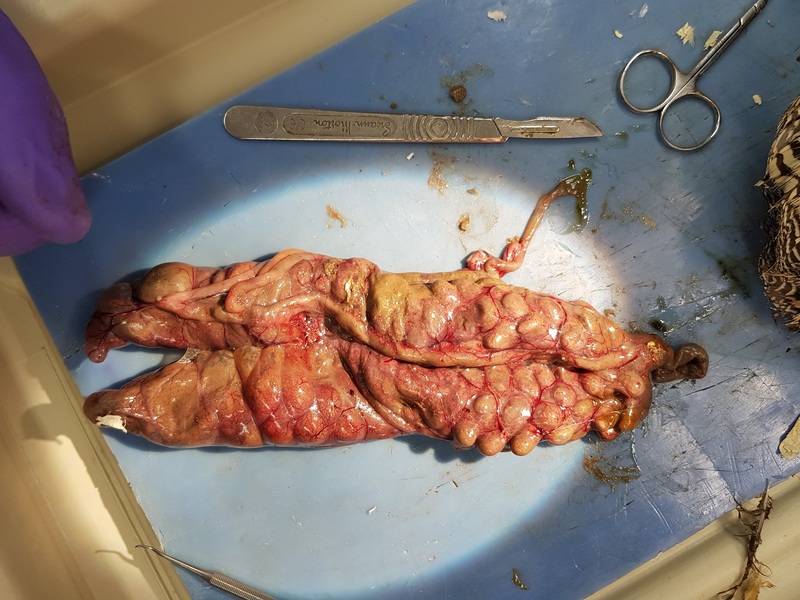 (2) How do you safely anaesthetize a Nile crocodile? There’s now a rigorous protocol (from our DAWNDINOS work). (3) Kickstarting my broad interest in how animals do “extreme” non-locomotor motions, we simulated how greyhounds stand up, finding that even without stretchy tendons they should, barely, be able to do it, which is neat. Expect much more about this from us in due time. (5) Hey did you ever think about how bone shape differs between hopping marsupials (macropods) and galloping artiodactyl (even-toed) mammals? We did, in long-the-making work from an old BBSRC grant with Michael Doube et al., and one cool thing is that they mostly don’t change shape with body size that differently, even though one is more bipedal at faster speeds—so maybe it is lower-intensity, slower behaviours that (sometimes?) influence bone shape more? So there you have the skinny on what we’ve been up to lately, messing around with evolution, biomechanics and morphology. As 2017 approaches its end, there have been a few papers I’ve been involved in that I thought I’d point out here while I have time. Our DAWNDINOS project has been taking up much of that time and you’ll see much more of that project’s work in 2018, but we just published our first paper from it! And since the other two recent papers involve a similar theme of muscles, appendages and computer models of biomechanics, they’ll feature here too. Stomach-Churning Rating: 0/10; computer models and other abstractions. We have been working with Alejandro Otero and Diego Pol on Mussaurus for many years now, starting with Royal Society International Exchange funds and now supported by my ERC grant “DAWNDINOS”. It features in our grant because it is a decent example of a large sauropodomorph that was probably still bipedal and lived near the Triassic-Jurassic transition (~215mya). 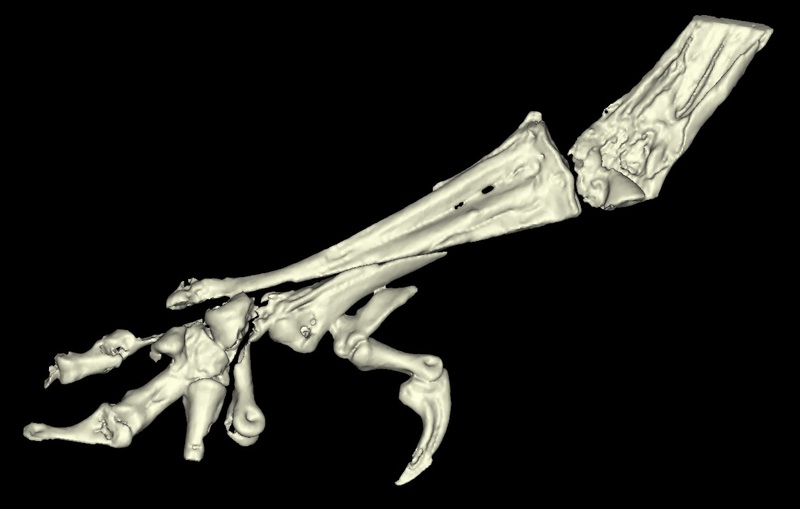 In our new study, we applied one of my team’s typical methods, 3D musculoskeletal modelling, to an adult Mussaurus’s forelimbs. This is a change of topic from the hindlimbs that I’ve myopically focused on before with Tyrannosaurus and Velociraptor [in an obscure paper that I should never have published in a book! pdf link], among other critters my team has tackled (mouse, elephant [still to be finished…], ostrich, horse, Ichthyostega… dozens more to come!). But we also modelled the forelimbs of Crocodylus johnstoni (Australian “freshie”) for a key comparison with a living animal whose anatomy we actually knew, rather than reconstructed. Mussaurus above; Crocodylus below; forelimb models in various views; muscles are red lines. The methods for this biomechanical modelling are now standard (I learned them from their creator Prof. Scott Delp during my 2001-2003 postdoc at Stanford): scan bones, connect them with joints, add muscle paths around them, and then use the models to estimate joint ranges of motion and muscle moment arms (leverage) around joints. I have some mixed feelings about developing this approach in our 2005 paper that is now widely used by the few teams that study appendicular function in extinct animals. As a recent review paper noted and I’ve always cautioned, it has a lot of assumptions and problems and one must exercise extreme caution in its design and interpretation. Our new Mussaurus paper continues those ruminations, but I think we made some progress, too. So Mussaurus, like other early sauropodomorphs such as Plateosaurus, probably wasn’t quadrupedal, and thus quadrupedalism must have evolved very close to in the Sauropoda common ancestor. Second, we compared the muscle moment arms (individual 3D “muscle actions” for short) in different poses for all of the main forelimb muscles that extend (in various ways and extents) from the pectoral girdle to the thumb, for both animals, to see how muscle actions might differ in Crocodylus (which would be closer to the ancestral state) and Mussaurus. Did muscles transform their actions in relation to bipedalism (or reversal to quadrupedalism) in the latter? Well, it’s complicated but there are a lot of similarities and differences in how the muscles might have functioned; probably reflecting evolutionary ancestry and specialization. 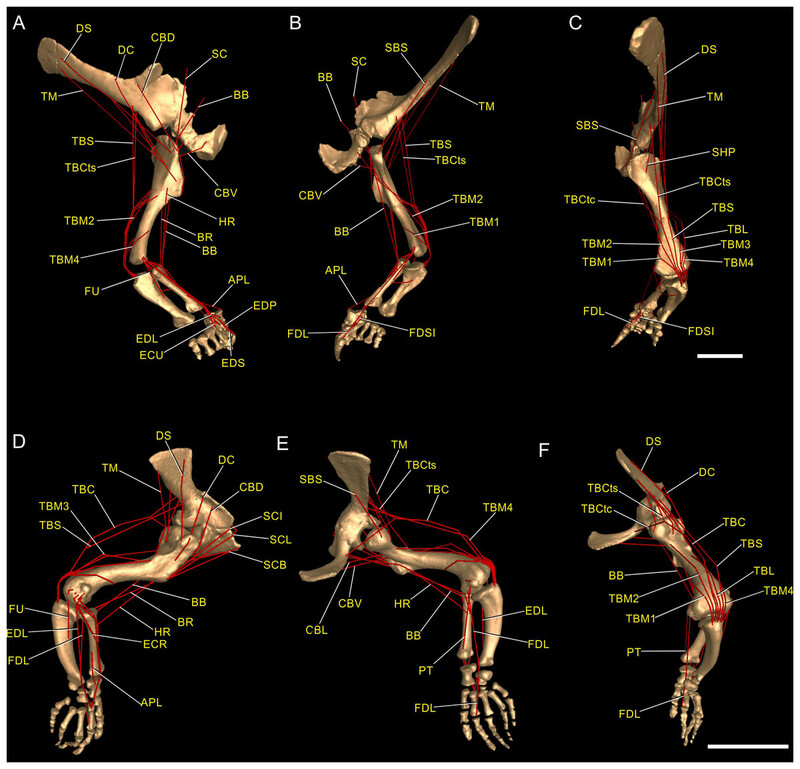 What I found most surprising about our results was that the forelimbs didn’t have muscles well-positioned to pronate the forearm/hand, and thus musculoskeletal modelling of those muscles reinforced the conclusions from the joints that quadrupedal locomotion was unlikely. I think that result is fairly robust to the uncertainties, but we’ll see in future work. You like moment arms? We got moment arms! 15 figures of them, like this! And tables and explanatory text and comparisons with human data and, well, lots! If you’re really a myology geek, you might find our other conclusions about individual muscle actions to be interesting—e.g. the scapulohumeralis seems to have been a shoulder pronator in Crocodylus vs. supinator in Mussaurus, owing to differences in humeral shape (specialization present in Mussaurus; which maybe originated in early dinosaurs?). 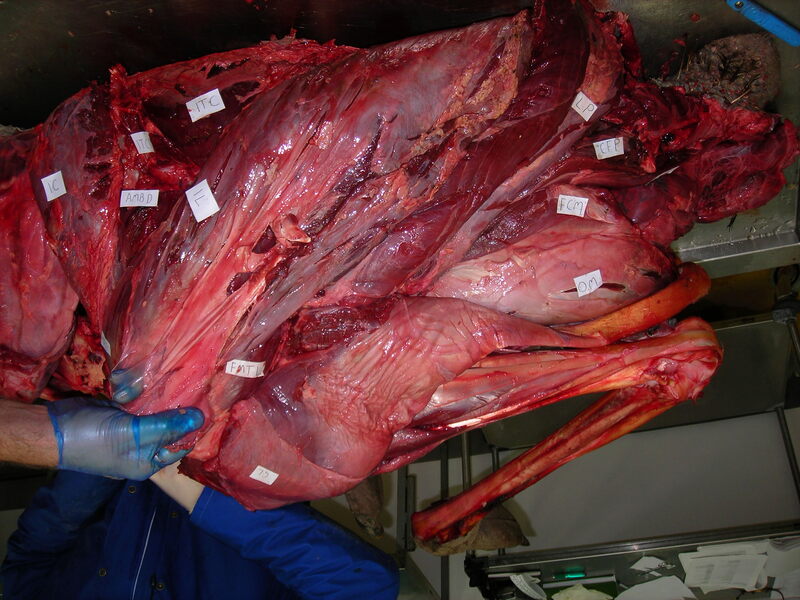 Contrastingly, the deltoid muscles acted in the same basic way in both species; presumed to reflect evolutionary conservation. And muuuuuuch more! Do you want to know more? You can play with our models (it takes some work in OpenSim free software but it’s do-able) by downloading them (Crocodylus; Mussaurus; also available: Tyrannosaurus, Velociraptor!). And there will be MUCH more about Mussaurus coming soon. What is awesome about this dinosaur is that we have essentially complete skeletons from tiny hatchlings (the “mouse lizard” etymology) to ~1 year old juveniles to >1000kg adults. So we can do more than arm-wave about forelimbs! But that’s not all. Last week we published our third paper on mouse hindlimb biomechanics, using musculoskeletal modelling as well. This one was a collaboration that arose from past PhD student James Charles’s thesis: his model has been in much demand from mouse researchers, and in this case we were invited by University of Virginia biomechanical engineers to join them in using this model to test how muscle fibres (the truly muscle-y, contractile parts of “muscle-tendon units”) change length in walking mice vs. humans. It was a pleasure to re-unite in coauthorship with Prof. Silvia Blemker, who was a coauthor on that 2005 T. rex hindlimb modelling paper which set me on my current dark path. Mouse and human legs in right side view, going through walking cycles in simulations. Too small? Click to embiggen. We found that, because mice move their hindlimb joints through smaller arcs than humans do during walking and because human muscles have large moment arms, the hindlimb muscles of humans change length more—mouse muscles change length only about 48% of the amount that typical leg muscles do in humans! This is cool not only from an evolutionary (mouse muscles are probably closer to the ancestral mammalian state) and scaling (smaller animals may use less muscle excursions, to a point, in comparable gaits?) perspective, but it also has clinical relevance. Simulated stride for mouse and human; with muscles either almost inactive (Act=0.05) or fully active (Act=1). Red curve goes through much bigger excursions (along y-axis) than blue curve), so humans should use bigger % of their muscle fibre lengths in walking. Too small? Click to embiggen. My coauthors study muscular dystrophy and similar diseases that can involve muscle stiffness and similar biomechanical or neural control problems. Mice are often used as “models” (both in the sense of analogues/study systems for animal trials in developing treatments, and in the sense of computational abstractions) for human diseases. 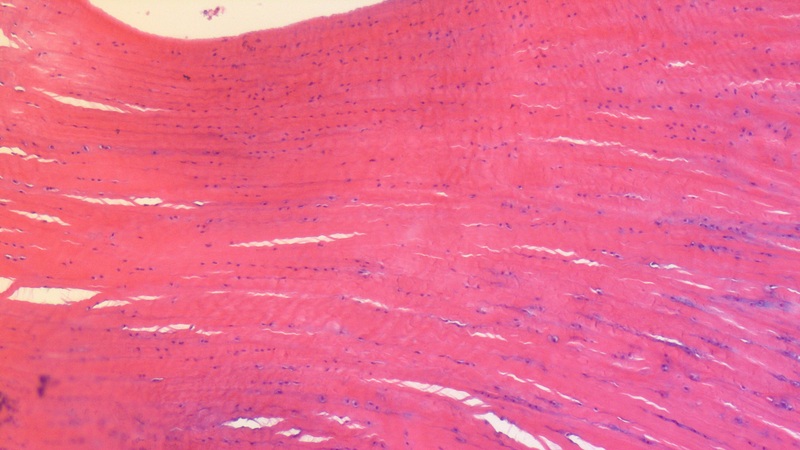 But because mouse muscles don’t work the same as human muscles, especially in regards to length changes in walking, there are concerns that overreliance on mice as human models might cause erroneous conclusions about what treatments work best to reduce muscle stiffness (or response to muscle stretching that causes progressive damage), for example. Thus either mouse model studies need some rethinking sometimes, or other models such as canines might be more effective. Regardless, it was exciting to be involved in a study that seems to deliver the goods on translating basic science to clinical relevance. 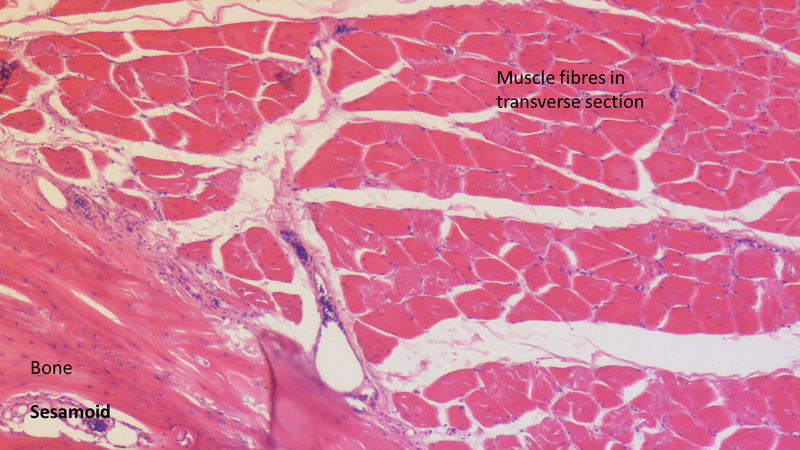 Muscle-by-muscle data; most mouse muscles go through smaller excursions; a few go through greater; some are the same as humans’. Finally, a third recent paper of ours was led by Julia Molnar and Stephanie Pierce (of prior RVC “Team Tetrapod” affiliation), with myself and Rui Diogo. This study tied together a bunch of disparate research strands of our different teams, including musculature and its homologies, the early tetrapod fossil record, muscle reconstruction in fossils, and biomechanics. And again the focus was on forelimbs, or front-appendages anyway; but turning back the clock to the very early history of fishes, especially lobe-finned forms, and trying to piece together how the few pectoral fin muscles of those fish evolved into the many forelimb muscles of true tetrapods from >400mya to much more recent times. Humerus in ventral view, showing muscle attachments. Extent (green) is unknown in the fossil but the muscle position is clear (arrow). We considered the homologies for those muscles in extant forms, hypothesized by Diogo, Molnar et al., in light of the fossil record that reveals where those muscles attach(ed), using that reciprocal illumination to reconstruct how forelimb musculature evolved. This parallels almost-as-ancient (well, year 2000) work that I’d done in my PhD on reconstructing hindlimb muscle evolution in early reptiles/archosaurs/dinosaurs/birds. Along the way, we could reconstruct estimates of pectoral muscles in various representative extinct tetrapod(omorph)s.
Disparity of skeletal pectoral appendages to work with from lobe-fins to tetrapods. Again, it’s a lengthy, detailed study (31 pages) but designed as a review and meta-analysis that introduces readers to the data and ideas and then builds on them in new ways. I feel that this was a synthesis that was badly needed to tie together disparate observations and speculations on what the many, many obvious bumps, squiggles, crests and tuberosities on fossil tetrapods/cousins “mean” in terms of soft tissues. The figures here tell the basic story; Julia, as usual, rocked it with some lovely scientific illustration! Short message: the large number of pectoral limb muscles in living tetrapods probably didn’t evolve until limbs with digits evolved, but that number might go back to the common ancestor of all tetrapods, rather than more recently. BUT there are strong hints that earlier tetrapodomorph “fishapods” had some of those novel muscles already, so it was a more stepwise/gradual pattern of evolution than a simple punctuated event or two. 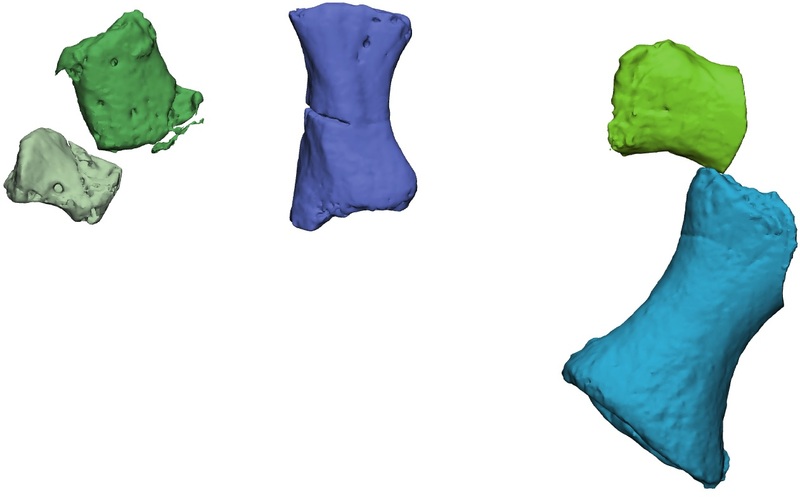 Colour maps of reconstructed right fin/limb muscles in tetrapodomorph sarcopterygian (~”fishapod”) and tetrapod most recent common ancestors. Some are less ambiguous than others. That study opens the way to do proper biomechanical studies (like the Mussaurus study) of muscle actions, functions… even locomotor dynamics (like the mouse study)– and ooh, I’ve now tied all three studies together, tidily wrapped up with a scientific bow! There you have it. I’m looking forward to sharing more new science in 2018. We have some big, big plans! Hi, sorry for the social media spam but this is important to me: I got EU money to study dinosaur movement and we made a website for the project. There will be some fun stuff posted there and nowhere else, such as new palaeo-art that we commissioned specifically for this project. Oh, and science, too! Five years of science! So please have a look at it now that it is live! I love our logo (by Andrew Bourne) so I will spray paint it everywhere I can. Work from the DAWNDINOS project won’t be featured here much, so either watch that new website or me on other social media to find out what’s up! And coming up on John’s Freezer: another episode of “Better Know A Muscle”! Yeah, baby! 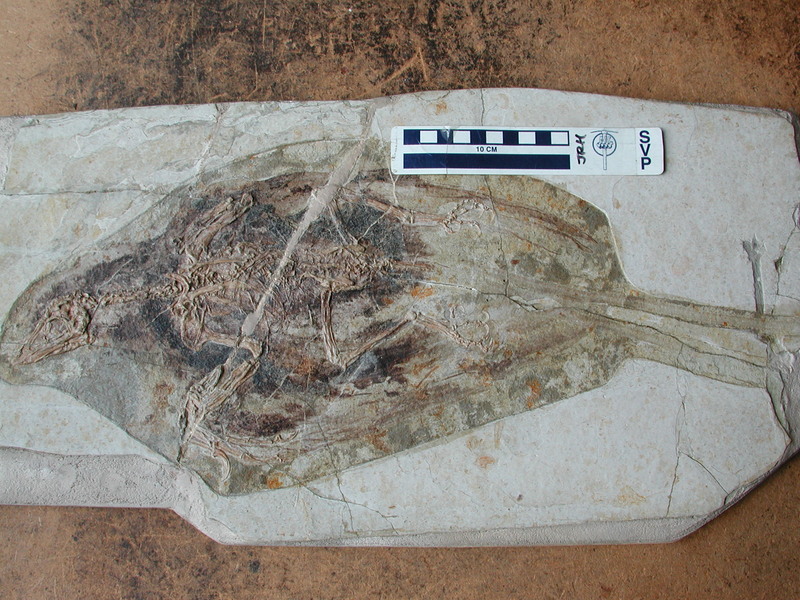 A Confuciusornis fossil; not the one from our study but prettier (more complete). Today almost three years of collaboration come together in a publication that is a fun departure from my normal research, but also makes sense in light of it. Professor Baoyu Jiang from Nanjing University in China has been being working on the taphonomy of the Early Cretaceous Jehol biota from northeastern China (Manchuria) for a while, and he found a lovely Confuciusornis (early bird) fossil; one of thousands of them; from the volcanic pyroclastic flow-based lake deposits there. Although at first glance the skeletal remains of that fossil are not fabulous compared with some other Confuciusornis, what makes this one lovely is that, on peering at it with multiple microscopic and other imaging techniques, he (and me, and a China-UK collaboration that grew over the years) found striking evidence of very well-preserved fossil soft tissues. Our paper reporting on these findings has gone live in Nature Communications so I can blog about it now. Stomach-Churning Rating: 3/10; gooey, but fossil gooey, except for some colourful, gastrically-tolerable histology of bird tissue. Front view of the ankle/foot of our specimen. Back view of the ankle/foot of our specimen. What has been fun about this collaboration is that, for one, it fits in perfectly with my prior work. 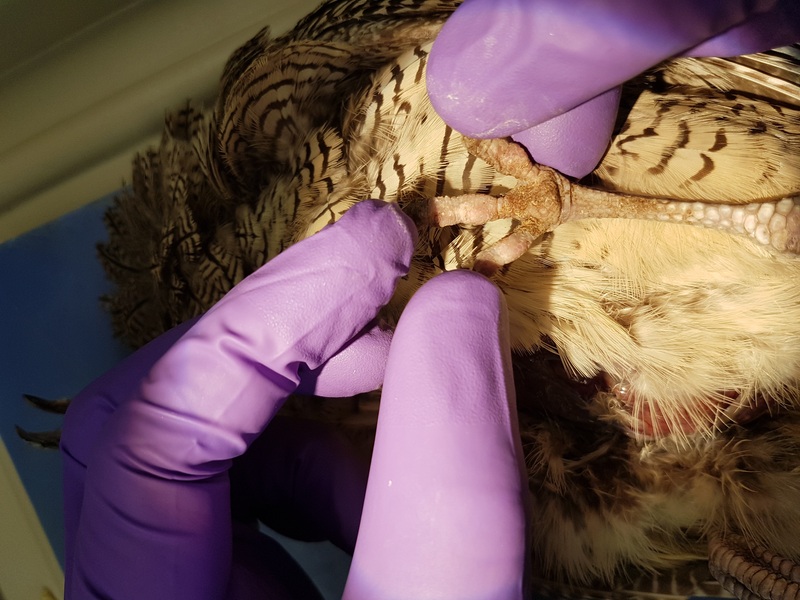 Ever since my PhD thesis I’d been wondering about odd bones in the legs of birds, including a very puzzling and very, very neglected bit of bone called the tarsal sesamoid, on the outside of the upper end of the ankle joint. 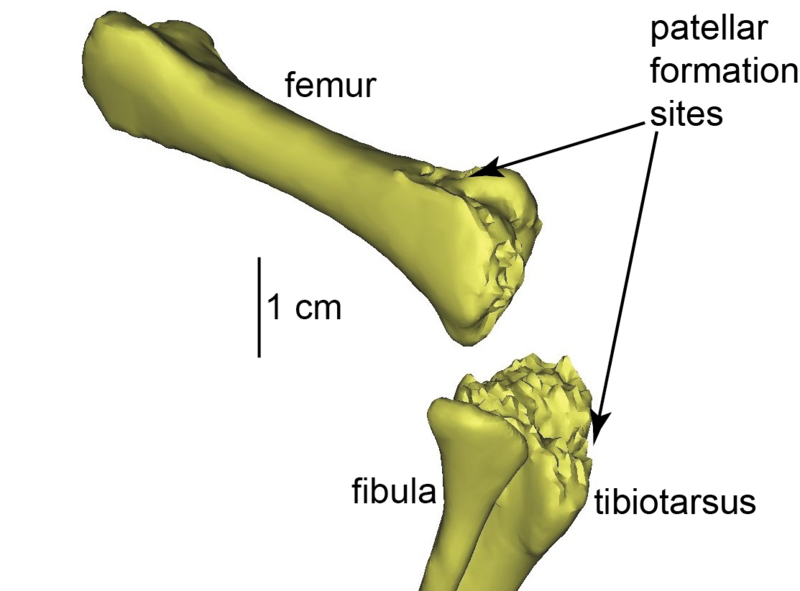 Furthermore, a tunnel of tissue called the tibial cartilage sits next to that sesamoid bone, and then across the ankle joint there is a bony prominence with grooves and tunnels that vary highly among bird species; that is called the hypotarsus. These structures are all known in living birds and, to a degree, in extinct fossil cousins. Our specimen seems to reveal an earlier stage in how these little features of bird ankles originated, which we concluded to be a step along the transition to the more crouched legs that modern birds have. This study has also challenged me to broaden my horizons as a scientist. Although this was a big collaboration and thus we had several specialists to apply supercharged technological techniques to our fossil, I had to learn something about what all that meant. My kind colleagues helped me learn more about tissue histology, scanning electron microscopy, synchrotron mapping, FTIR and mass spectrometry and more. I won’t go through all of these techniques but there are some pretty pictures sprinkled here and in the paper, and a lot more detail in the paper for those who want the gory techno-detail. Basically we threw the kitchen sink of science at the fossil to crack open some of its secrets, and what we found inside was nifty. 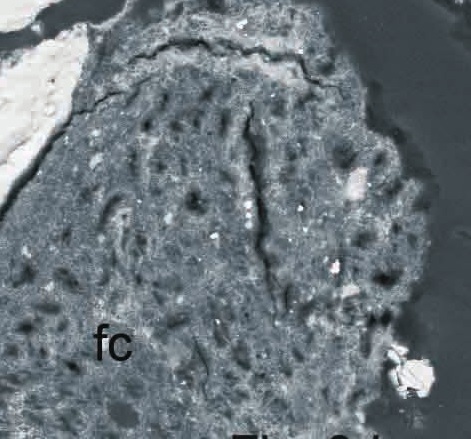 Scanning electron micrograph image of probable tendon or ligament fibres (arrow) in cross-section, from near the ankle joint. 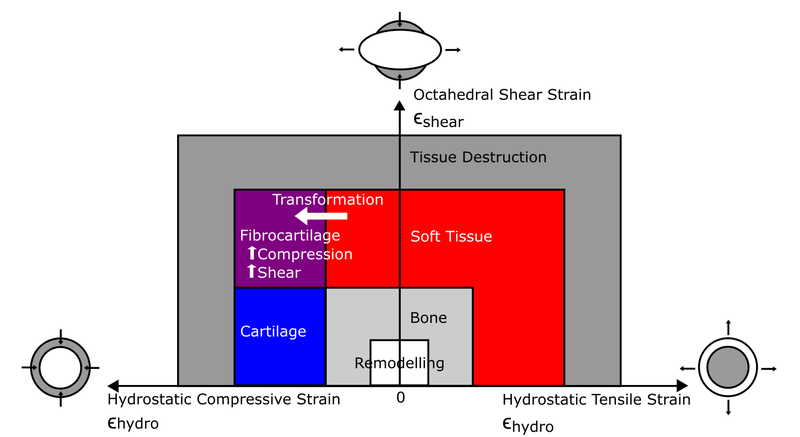 We found preserved cells and other parts of connective tissues including tendons and/or ligaments, fibrocartilage (the tougher kind) and articular cartilage (the softer joint-padding kind). That’s great, although not unique, but the kitchen sink also flushed out even more reductionist data: those tissues included some organic residues, including what appear to be bits of proteins (amino acids); particularly the collagen that makes up tendons. 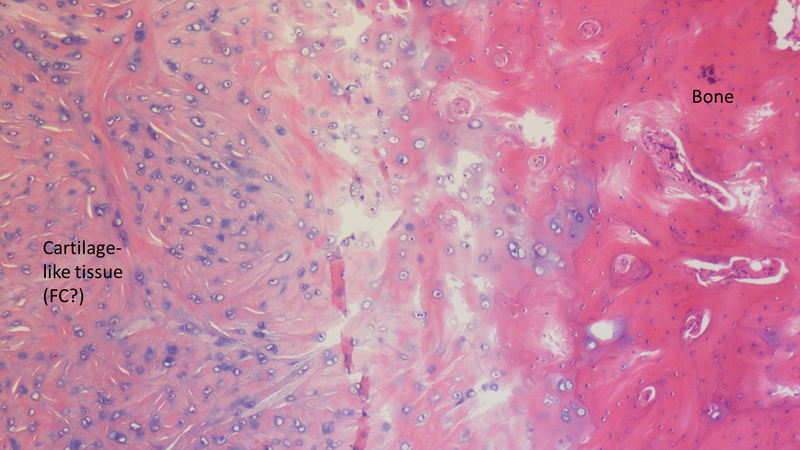 Fibrocartilage (“fc”) from the ankle joint region. Hopefully we’re right, and we included as much of the data as we could manage so that others can look at our findings. The specimen is crushed into nearly two dimensions, like all Jehol biota organisms, so its anatomy was hard to interpret but we think we got it right. All of the other kitchen-sinky tools have their own nuances and pitfalls but we did our best with a superb team of experts. We’ve had to wait 125 million years to uncover this specimen and a few more years to find out if we’ve looked at the right way is no greater test of patience. I thank my coauthors, especially Baoyu Jiang for the kind invitation to participate and the very fun experience of collaborating. I think I’ll remember this study for a long time because, for me, it takes a step beyond just describing Another Case of Jaw-Dropping Fossilization (can you hear the hipsters recounting the excitement and cynicism of the 1990s when this all was dawning? I was there and maybe now I’m one of them). 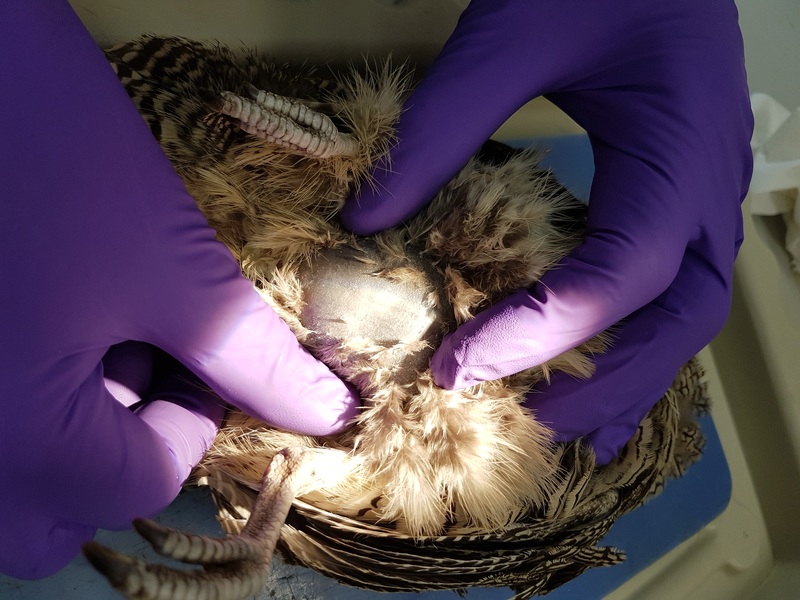 By combining all of those methods we learned new things about the palaeobiology of birds and the evolution of traits within birds. Confuciusornis, not shockingly, had ankles that should have functioned in ways intermediate between those of bog-standard non-avian theropods and modern birds. I’m hopeful that more synthesis of molecular/cellular, imaging, biomechanical and other tools (not to mention good old palaeontology and anatomy!) can wash away some more of this mystery. And it was fun to be a part of a study that adds to overwhelming evidence that was heretical ~25 years ago: some hardy biomolecules such as collagen and keratin can survive hundreds of millions of years, not just thousands. Pioneers such as Prof. Mary Schweitzer led the original charge that made reporting on discoveries like ours much easier today. “I know how the birds fly, how the fishes swim, how animals run. But there is the Dragon. I cannot tell how it mounts on the winds through the clouds and flies through heaven. Today I have seen the Dragon.“– Confucius, ca. 500 BCE. 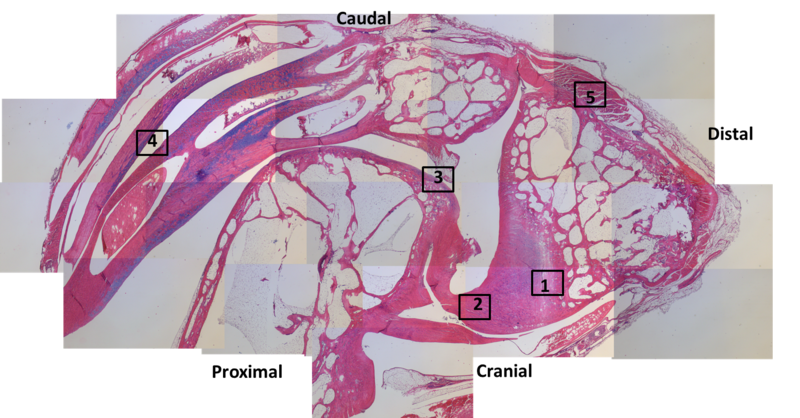 Patchwork of histology slide images, from a guineafowl’s ankle (as per photo above). The numbered squares correspond to zoomed-in images below. The tibiotarsus is on the proximal end (bottom left); the tarsometatarsus is on the distal end (right side); and the enigmatic tarsal sesamoid is at the top. Magnification: 20x overall. 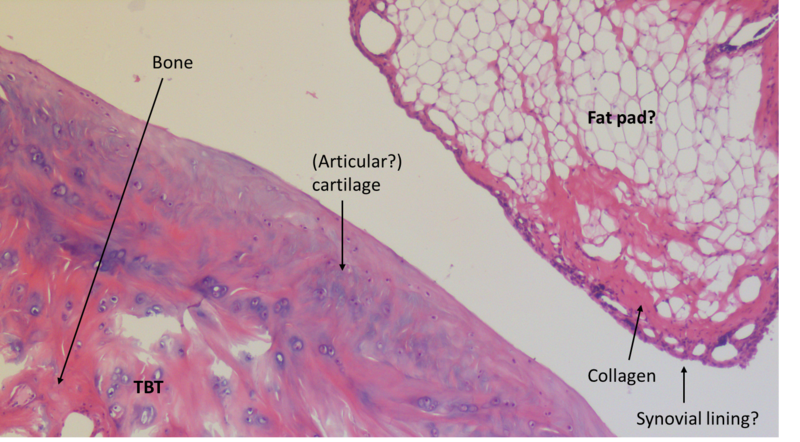 Region 1. nice (fibro)cartilage-bone inferface at ligament insertion. 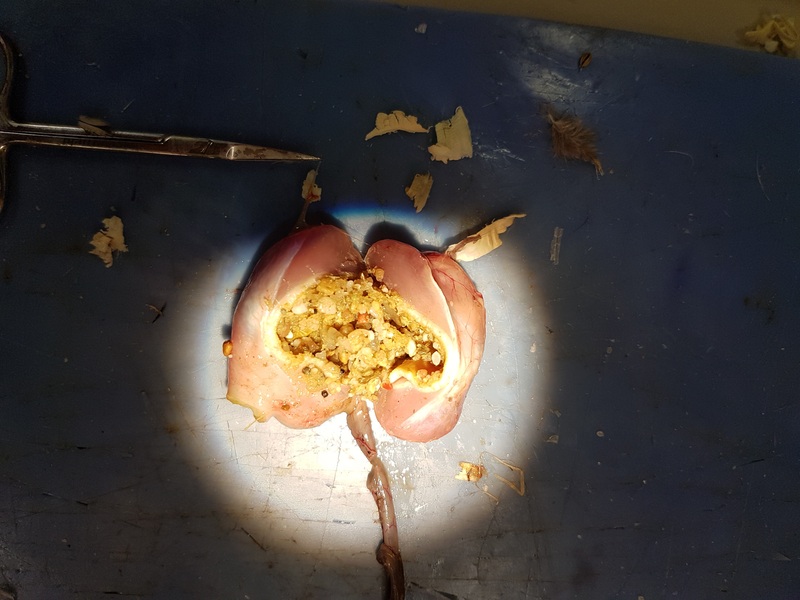 Region 2: longitudinal slice through ligaments connecting the tibiotarsus to the tarsometatarsus across the ankle joint. Region 3: front (bottom) of the tibiotarsus/upper ankle. 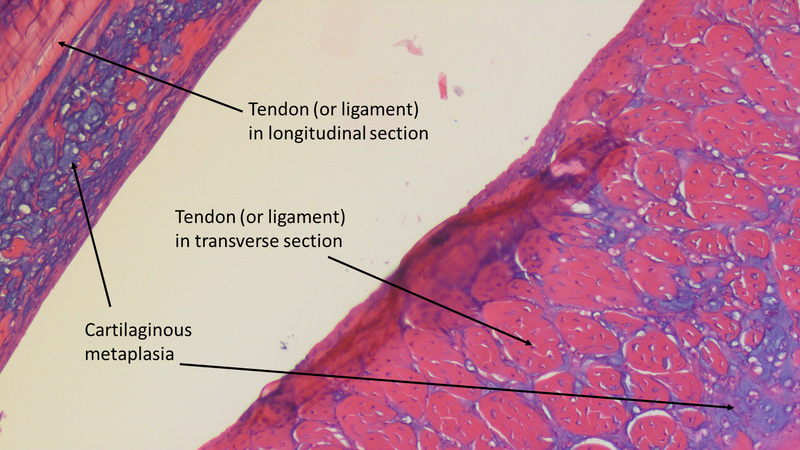 Region 4: tendon fibres in longitudinal section; on the back of the tibiotarsus. 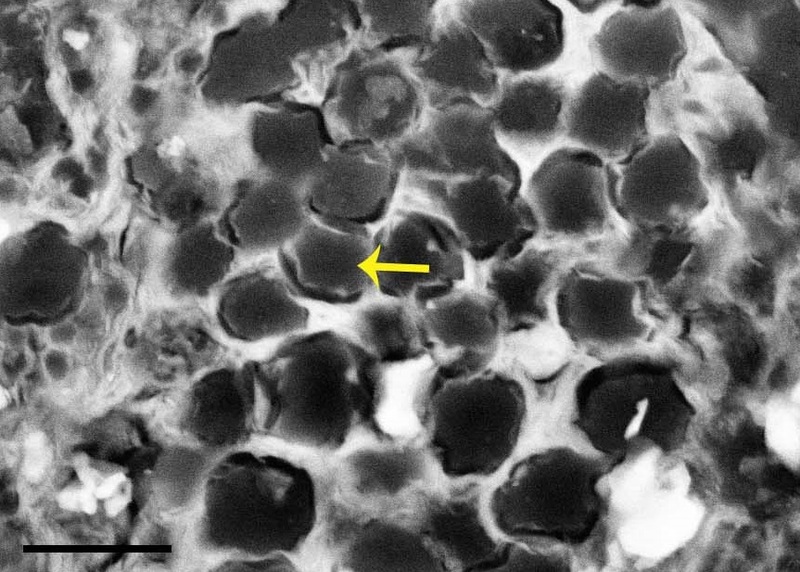 Some show mineralization into ossified tendons (“metaplasia”); another curious feature of modern birds. 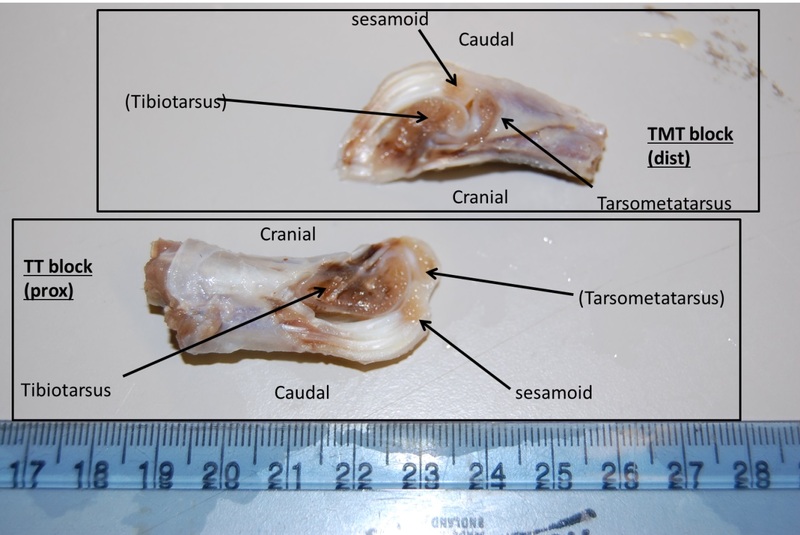 Region 5: muscle attachment to the back of the upper tarsometatarsus bone. Small sesamoid fragment visible. Stomach-Churning Rating: -10/10 Let’s do some SCIENCE! Update: all jobs have closed for applications. Note that on the bottom of each page linked above, there are Person Specification and Job Description documents that explain more what the jobs are about and what skills we’re looking for in applicants. I strongly encourage any applicants to read these before applying. If those documents don’t describe you reasonably well, it is probably best not to apply, but you can always contact me if you’re not sure. The project for jobs 2-4 is about testing the “locomotor superiority hypothesis”, an old idea that dinosaurs gained dominance in the Triassic-Jurassic transition because something about their locomotion was better in some way than other archosaurs’. That idea has been dismissed, embraced, ignored and otherwise considered by various studies over the past 40+ years but never really well tested. So in we go, with a lot of biomechanical and anatomical tools and ideas to try to (indirectly) test it! As usual for projects that I do, there is a healthy mix of empirical (e.g. experiments) and theoretical (e.g. models/simulations) research to be done. Please spread the word if you know of someone right for any of these roles. I am casting a broad net. The next year (and beyond) is going to be a very exciting time on my team, with this big ~£1.9M ERC Horizon 2020 grant starting and lots of modelling, simulation, experiments, imaging and more. Non-EU/EEA/UK people are very welcome to apply– “Brexit” is not expected to affect this project. If you’re not familiar with my team, check out my “mission statement” for what we stand for professionally and as a team. Join us!